Dental consultants to help your staff convert calls to patients! Your dental staff has access to world-class training videos and live dental consultants that provide training and coaching. Take a look at one of our trainings. 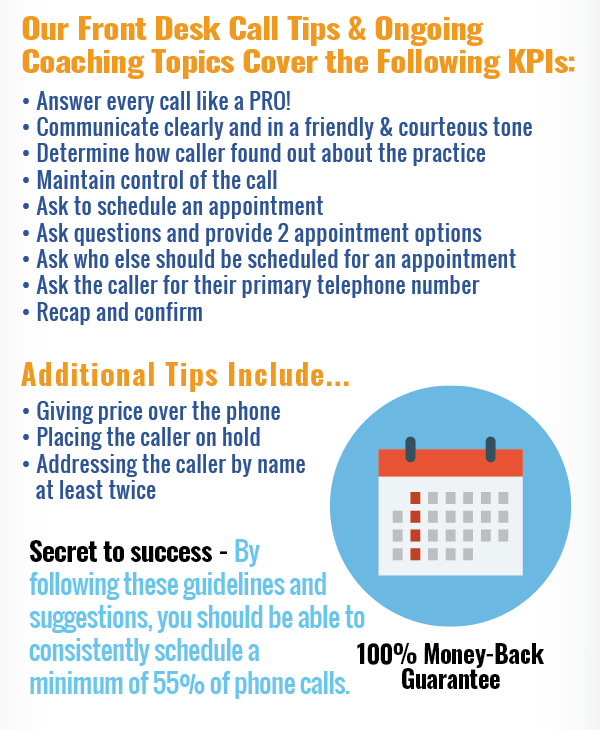 We’ve listened to thousands of incoming calls to practices across the nation. We have a goldmine of information that allows us to produce world class dental staff coaching videos. It is our goal to improve staff proficiency in scheduling new patients. Each of our videos is based upon 7 Key Performance Indicators (KPIs) we have identified over the years that will improve your staff’s closing ratio. These videos are delivered based upon the results of your dental mailing campaign, so your staff can continually perfect their skills and bring in more patients to be scheduled. A one-time training meeting is not enough to change habits. Our staff listens to phone recordings and scores your staff on every call that comes to the office from the dental postcard mailing. Because we analyze each call based on the 7 Key Performance Indicators, your dedicated account manager is able to continually monitor the results of your practice and provide customized staff coaching videos based on the needs of your staff. They are also available to individually help the staff as well. The synergy of our training and coaching program with everything else we do is what delivers you the best ROI for your practice.